I thought Series 3 of the GI Joe Kreon packs would never show up. It's been almost a year since Series 2 hit stores, after all. But amazingly, TЯU finally put some out, and (using our decoder) I was able to get some of the ones I wanted. Kreons don't have bowdlerized biographies any more, but Torch was kind of silly to begin with. His original filecard said his specialty was "Works with Oxy-Acetylene torch as a general cutter mostly on remodeling stolen cars and occasional safe crackings. Scavenges the swamps for fun and profit." Direct quote! Other than the full, luxurious head of hair, Torch's details are all created with paint. He's got a red headband, solid black sunglasses, and a Franz Joseph beard. He's wearing a black vest with three straps across his stomach, and a tiny skull necklace hanging against his chest - in a great detail, the skull is shaped like a Kreon head. His hands are gray (gloves, duh) and there's a band painted around his left bicep. 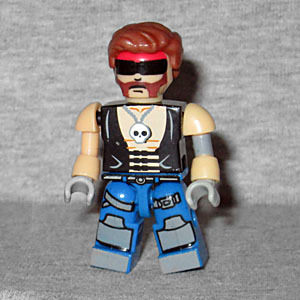 His legs are blue, to suggest jeans, while the details of his boots, belt, and the various straps around his legs are done in grey. And it's just on the front of the legs: it doesn't continue around the sides to become a knife and a holster. This figure makes the common mistake of assuming Torch's weapon is a flamethrower. It's not. It's a cutting torch - a much different weapon. Of course, there's only so much they can do with existing Kre-O parts, so we're not going to complain too much. The base is a normal gun, with three add-on pieces to make it look more flame... thrower... y? ["Flamboyant" --ed.] 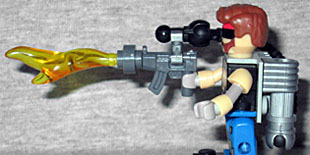 A flexible tube connects to the backpack, which gamely attempts to look like the frame and fuel tank the real toy has. Sadly, he does not come with a can of grape soda. What a loss!